The absence of thinking Christians and Christian thinking (on many important issues) was brought to the fore by a student of C. S. Lewis in the 1960s. “There is no longer a Christian mind” is the first sentence of The Christian Mind: How Should A Christian Think? by Harry Blamires. Stott’s contribution to the discussion (1972) provided a corrective for a problem that continues to plague the church today. The “mindless Christianity” that he described in Chapter 1 had, and has, several characteristics. 4. An anti-intellectualism that views theology with distate and distrust. I am not pleading for a dry, humorless, academic Christianity, but for a warm devotion set on fire by truth. I long for this biblical balance and the avoidance of fanatical extremes. I shall urge that the remedy for an exaggerated view of the intellect is neither to disparage it, nor neglect it, but to keep it in its God-appointed role. Stott goes on to present a case for a “thinking Christianity” that is built on the doctrines of creation, revelation, redemption, and judgment. · Judgment – For if one thing is clear about biblical teaching on the judgment of God, it is that he will judge us by our knowledge, by our response (or lack of response) to his revelation. … It is a solemn thought that by our anti-intellectualism, in which we either refuse or cannot be bothered to listen to God’s word, we may be storing up for ourselves judgment of Almighty God. Stott sums up his brief discussion this way. God has constituted us thinking beings; he has treated us as such by communicating with us in words; he has renewed us in Christ and given us the mind of Christ; and he will hold us responsible for the knowledge we have. Perhaps the current mood (cultivated in some Christian groups) of anti-intellectualism begins now to be seen as the serious evil that it is. It is not true piety at all but part of the fashion of the world and therefore a form of worldliness. To denigrate the mind is to undermine foundational Christian doctrines. Has God created us rational beings, and shall we deny our humanity which he has given us? Has God spoken to us, and shall we not listen to his words? Has God renewed our mind through Christ, and shall we not think with it? Is God going to judge us by his Word, and shall we not be wise and build our house on this rock? 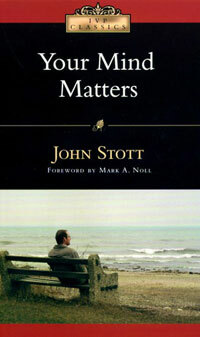 John Stott’s Your Mind Matters: The Place of the Mind in the Christian Life can be purchased in hard copy here. It is available online in pdf here. John R. W. Stott, who died in 2011, was a British pastor and worldwide leader of Evangelical Christians. In 2005, Time magazine listed Stott among the 100 most influential people in the world. The author of numerous books, Stott’s The Cross of Christ is widely considered a classic study of the central theme of the Christian faith. I would point out that one result of anti-intellectualism was to insulate said Christians from the cultural zeitgeist, which is well-illustrated by Allan Bloom’s The Closing of the American Mind as well as Os Guinness’ The Gravedigger File. In particular, Christians have not lost a belief in the supernatural (which I would define as simply “there is always more to know than we can draw a box around”), nor have they lost a belief in Aristotelian final causes. In contrast, many secularists and scientists have finite-ized the world (or ‘disenchanted’ it) and denied purpose, other than human-constructed purpose, including creation of an “artificial soul” as Bloom discussed and CS Lewis articulated in The Abolition of Man. The secularist tends to deny the ‘metaphysical dream’ of which Weaver speaks in Ideas Have Consequences, and ends up believing in nothing except smuggled reasons, as Smith articulates in The Disenchantment of Secular Discourse. We have traded the infinite, invisible God for finite, visible idols. Idols do not experience reality nor do they act in reality; we are getting closer and closer to being like them. I have no praise for anti-intellectualism, but I think like depression, it did defend against an insidious ‘mind-virus’, to steal a phrase from the New Atheists. It is, of course, better to fight secularism et al head-on. We could, for example, revitalize philosophy as being on equal if not greater footing than science, and thus dethrone scientism. This would let us critique the philosophy which is often attached to the science of evolution on philosophical grounds, like Aquinas would (see Feser’s The Last Superstition). We could start talking about seeking a common good and having true freedom, as Jacques Ellul describes in The Subversion of Christianity and The Ethics of Freedom. We could start being more than just a collection of lonely individuals. We could realize Aristotle’s polis once again, and learn what true friendship can be like. Luke, it’s hard to see a thread running through your wildly varied comments.